Master PDF Editor Easter 2019 Giveaway! We would like to thank Code Industry Ltd.
Master PDF Editor is multifunctional PDF documents editor which can also be used to view PDF files. It enables users to edit or remove documents’ contents and also to create, comment, compose and sign PDF files. Master PDF Editor is straightforward, easy to use PDF editor equipped with powerful multi-purpose functionality needed for all the user's PDF needs. Master PDF Editor generates PDF documents according to PDF 1.7 specifications. Master PDF Editor provides extensive functionality for work with PDF files, which makes it one of the best PDF editing software. Master PDF Editor user interface is similar as that of all the commercially available competitors in the market. The usual menu, context menus, and toolbars are there plus the margins are there for the user. Search functions, page previews, attachments and at the right marginal view is the "Object Inspector" which is an invaluable tool in Master PDF Editor because it is where the user will rely when performing editing functions. See images below for guidance of the main interface of Master PDF Editor. The "Object inspector" displays all relevant metadata that can be edited. Most edit boxes can be moved/adjusted in the main window but is much more advisable to use the corresponding data fields in the Object Inspector so the positioning will be exact/precise. To delete one or more pages in an existing PDF file, the user can either delete it via Document > Delete Pages or via the right-click menu in the thumbnails panel. See images below. To insert a page (or pages) or file to an existing PDF file, it is done via Document > Insert Pages. If inserting pages, the user should take care and discern the position of the pages to be inserted so as not to be confused. See images below. To insert a blank page (or pages) to an existing PDF file, the user should go to Document > Insert Blank Pages (or Ctrl+Shift+N). A dialogue box will appear and the user can set his preference there. See images below. To move a page inside an existing PDF document, the user can either go to Document > Move Pages or use the thumbnail side panel and manually drag the selected page to the new position desired. See images below. New in version 5.3.11, drag-n-drop feature is introduced between documents. To insert a desired page from a window to another window using drag-n-drop feature, both documents should be open in separate windows. If both documents are open in a single window the user just needs to right-click the document tab (say, Document 2) and select "Move to New Window". The user can now select his desired page/s (from that "New Window") "drag" it from its thumbnail panel and "drop" it to the desired position of the other widow's thumbnail panel (say, drag page 1 of Document 2 and drop it in "page 2 position" of Document 1). An insertion point/mark will appear ("red line") signifying location for a "drop". See images below. To insert a page/s from one document to another using drag-n-drop feature, the user needs to have both documents open in respective tabs (say, Document 1 in Tab 1 and Document 2 in Tab 3) and select the desired page/s to be inserted to the other document (say, page 1 of Document 1 to be inserted as page 2 of Document 2). The user needs to "drag" the desired page to the Document 2 tab (Tab 3). As he does that, Document 2 now becomes the "active" document. The user can now "drop" the desired page (page 1 of Document 1) to the position desired (as page 2 of Document 2). An insertion point/mark will appear ("red line") signifying a location for a "drop". See images below. (1) Page size -- (Media Box), this is where the user set the size of the page. Changing the values here modifies the format of the page. (2) Content size (Crop Box) this is where can modify the "inner margins" of the page content. Turn this "on" and the user can modify the values to suit his preference. To crop a page go to Document > Crop Pages (or press Ctrl+K). A crosshair cursor will appear indicating that the user should select a "crop area". The user must drag a rectangular area on the page encompassing the content that he wants to keep. 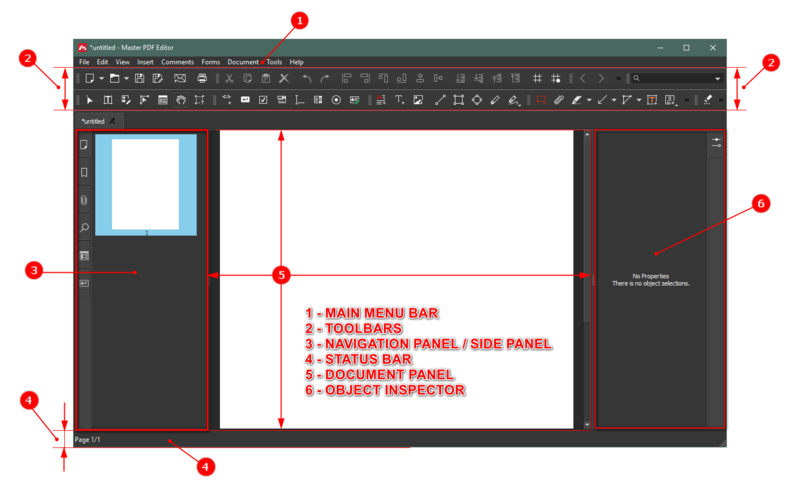 The "Object inspector" will show the "Page Layout" window where the user can precisely edit the crop region by entering the size manually or by using the up/down arrows to increase/decrease the size. See images below. To extract a page from an existing document and save it as a "new" PDF file go to Document > Extract Pages. The "Extract Pages" dialogue box will appear and this is where the user will set the "new file name" for the page to be extracted, the destination or location where it is to be saved. There are also options to "Extract bookmarks" or if there is >1 page that it is targeted to be exported to file, an "Extract pages as a single file". The user can just tick/untick the respective checkbox. See images below. Commenting allows the user to review a PDF document and add annotations, comments and other text/graphical information regarding the content. Comments may address certain parts of the document that require changes or be used as a collaborative work on the document itself to inform those all concerned on certain content that needs addressing/improvement. Commenting tools do not "alter" the original content and are not displayed in the printed document. See images below. Every PDF has objects in its contents whether it be images, text boxes, forms etc. To edit objects in a PDF document is to edit the "properties" of the object selected. The fastest way to edit any object inside a PDF documents content is to go to Tool > Edit Document or select the "Edit Document" icon in the Tools toolbar (likewise the user can press Alt+1). Once selected the user can just point to any object in the page to select it towards modification. The same procedure is also for editing images, go to Tools > Edit Images or select the "Edit Images" icon in the Tools toolbar. 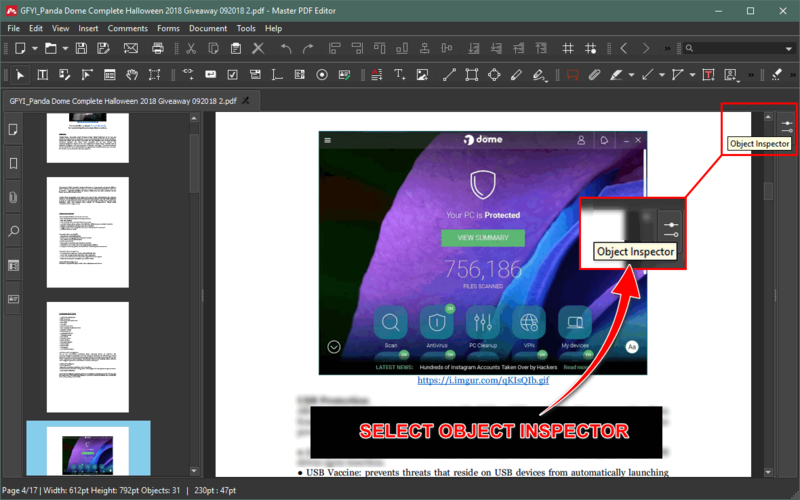 The "Object inspector" opens its properties. It is from there the user can edit/modify the selected object to his preference. To insert an image, go to Insert > Image. The cursor will change into a crosshair and the user must select the area where he intends to insert an image. The "Open Image" window will appear. The user must locate his preferred image, select it and afterwards click "Open" to attach the image to the desired position. The user can drag the resize handles or drag the image to position it properly on the document page. See images below. To extract an image and save it to file, the user should go to Tools > Edit Image. Then select the desired image to be saved to file. Right-click on the image and select "Save Image to file". A "Save As" window will appear. This is where the user can set to save the file to a desired "filetype" as well as the destination/location of the image file to be saved. Click "Save" to execute. See images below. To edit text in a PDF document go to Tools > Edit Text (or select the "Edit Text" icon in the Tools toolbar) and then double-click the text to edit/modify. The "Object inspector" (on the right panel) will show the "Text properties" and the user can edit it there, say, change the "Font" properties (size, color, width, opacity etc.). If the user wants to "maintain aspect ratio" relative to the value he enters, a checkbox is available there in the "Geometry" tab. Also the user can rotate the selected text by entering a value in “Rotate” box provided. To edit a "formatted text" the same procedure applies. 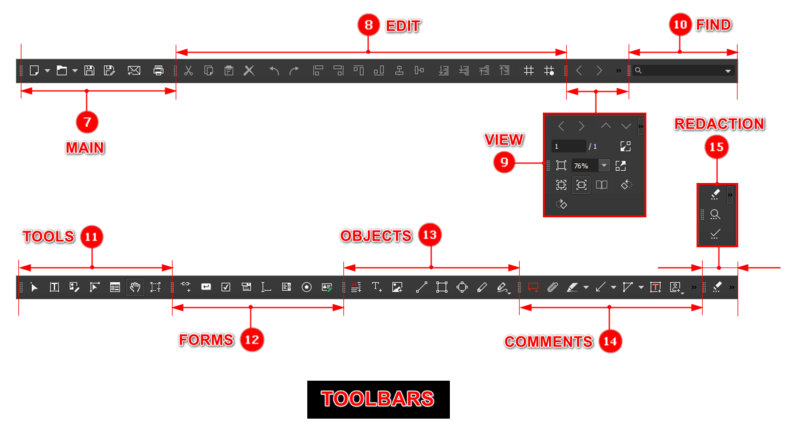 The user goes to Tools > Edit Text or select the "Edit Text" icon in the Tools toolbar. The "Object inspector" will show the "Formatted text properties" where the user can initiate to edit/modify to suit his preference. See images below. Watermark is a text or an image, positioned behind the document content. To add a watermark go to Document > Watermark > Add. The "watermark dialogue box will appear and here the user can either add a "text" or a "file" (say, an image file) as watermark. The user can modify any of the values to his preference. The user can also "delete" the added watermark to the document if he serves it fit. To delete go to Document > Watermark > Delete. See images below. For PDF documents that has a stamp or watermark, Master PDF Editor offers a way to remove them. To remove the watermark of the document the user must select the watermark and right-click > Delete. That's it. The user should not forget to save the watermarked document in a new file name or save it as a new PDF document. See images below. Password protecting a PDF document prevents unauthorized alterations to the document by unauthorized individuals. Access to a "password protected" document is halted unless the user will supply the correct password. To use password protection go to File > Properties. The "Document Properties" window will appear and then go to the "Security" tab. The user can enter his preferred password and if he wants opt to encrypt the document (128 bit RC4 or 256 bit AES). As plainly put this is "only" a password to open the PDF document. If the user want to share the document with another person but don't want others to be able to open it then choose this option. A permission password "permits only" the selected actions and denies access/prohibits all others. The selected actions can be seen and the appropriate checkbox can be ticked/unticked by the user depending on his preference. See images below. Open PDF documents to view, print, fill forms, edit any objects or save changes. Open to view, fill and print XFA formatted PDF documents. View password-encrypted documents (password required). Numerous document view options (choose page lathe user, rotate pager, display one or two pages at once, fullscreen mode etc.). Search for text in the document including comments (case sensitive / whole words only). Document navigation (move to specified page, move with bookmarks or page thumbnails). Copy text, images, forms and other objects. View attached files, rename, add or remove them. Send PDF files via email with application’s interface (GUI). Print PDF documents with a number of options (print document only, document with annotations etc.). Flexible setting for both application’s appearance and viewed document structure, including possibility to change color, font and document background. Can be used for comfortable reading of PDF books. Create PDF documents with built-in virtual printer from applications supporting print like Microsoft Word, Excel, OpenOffice (Windows only). Create documents with various page sizes by increasing, decreasing or cropping pages. Create documents out of existing PDF files and images. Scan paper documents to PDF. Recognize scanned images with possibility of text search and editing (text can be located both in front of the image and behind it). Add blank pages to the current document. Add pages from PDF files and images to the current document. Merge multiple documents into same file. Create a digital signature in the document with flexible settings for its visual representation (use image or formatted text). Sign document with digital certificate. Protect PDF documents with two kinds of passwords (a password for document opening and another for editing). Add different comments to the PDF document: sticky note, underlined text etc. Add typewriter comment to any area of the document page. Choose commented area with drawing tools and add a description. Attach a file as a comment. Add, edit, remove, replace or format text in the document. Convert PDF text image into editable text format. Add, edit or remove forms and manage them. Set up forms actions. Add, remove, edit and manage hyperlinks. Set up actions for hyperlinks. Copy and paste graphical objects and images. Move them, align, remove etc. Insert copied objects into multiple pages at once. Add, edit, remove watermarks, background or headers and footers in the document. Set parameters of these objects. Create, move, remove and edit bookmarks, set up actions with them. Manage document pages (insert, extract, remove, change size, order, rotate, crop etc.). Insert pages of the current document into another PDF file. Export and import pages including bookmarks. Optimize PDF files (by converting JPG and JBIG2 images, removing unused elements. Change document properties (name, general information, author etc.). Fill and save forms in PDF documents. Create and edit a variety of interactive forms (list field, test field, hyperlink, button, flag, switch etc.). Set specific form parameters for different languages. Export and import forms data. Locate form fields by the grid. Choose multiple form fields at same time for copy, alignment etc. Insert copied form field(s) on multiple pages at once. Fixed possible crash when copying forms. Fixed issues with dark theme. Fixed dialogue windows positions for large screens. To boost forum participation/contribution, all who wish to participate MUST have created a minimum of 3 threads and 5 posts (threads in sections: (i) Giveaways / Contests (ii) Deals and (iii) Geeks FYI > Feedback are NOT INCLUDED). Entries not meeting the requirement will be deleted. WE WILL BE CHECKING! "WHAT feature/s do you like to see added in Master PDF Editor and WHY?" winners will only have 3 days to send a PM to claim their prize. GIVEWAY / CONTEST IS NOW OPEN! I am not that familiar with Master PDF Editor but I read some review in internet that there is no guidelines / margins in page layout or in properties so I like to see that added. If we have margins or guidelines then it is easy to center things. Also if possible I saw a PDF with a video link attached so I also like to see that added in Master PDF Editor. That beats editing because I convert PDF first to Powerpoint and use the video attachment there or have video separate from PDF file. Thanks for this contest! Thanks also to Master PDF Editor maker! I had tried it a few months back and found it to be quite slow. Would like if the devs could speed and "smooth" it up!! Thanks a lot for the giveaway, jasonX and to Code Industry for sponsoring such an important event on GFYI! I would like to win a license for this very good software as i appreciate its awesome quality. Regarding the giveaway question i would like to see a PDF conversion feature in order to export the edited pdfs into a word, power point or other format in order to have it ready for universal processing further with general Microsoft tools. For me this software is excellent at the current state, so i would be delighted to have a license for it. Best of luck at all! Master PDF Editor not only provides abundant professional editing functions of PDF files, but also setting convenient and usable toolbar for user in comparison with the other PDF App. So I think that Master PDF Editor is an excelent PDF editor. I want to add security features in Master PDF Editor, such as setting User and Owner password in order to protect my PDF documents. I found Master PDF editor easy and quick to setup. I also found there are many features in it for novices and advanced users alike. I would like to see a ribbon interface option also in future versions and display of shortcut keys of all the functions mentioned next to the same. Thanks a lot for organising the giveaway and for letting me know of this great PDF editor!! Current time: 20 April 19, 10:30 Powered By MyBB, © 2002-2019 MyBB Group.